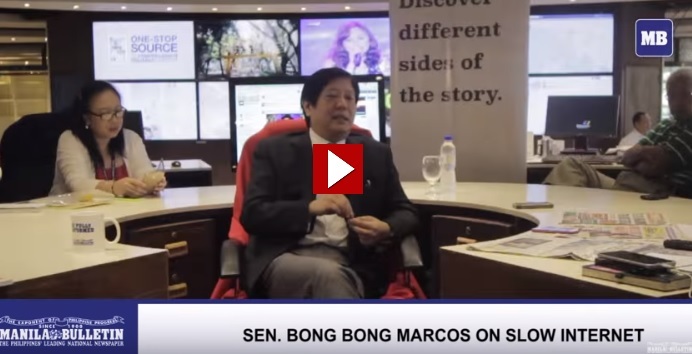 Bongbong Marcos once said: Internet is not just for social media, it’s crucial for business. It is not only for kids on Facebook and Twitter. The amount of commerce it generates now surpasses traditional trades five years ago. The former Senator explained this while he is on a hot seat even before the President expresses his worry about the negative effects of globalization on 3rd world countries like the Philippines. [VIDEO]: Manila Bulletin’s Hot Seat with Senator Ferdinand “Bongbong” Marcos, Jr.
President Rodrigo Du30 laments on the damage caused by globalization on poor economies such as the Philippines and urged Asian countries to take remedial steps to end their exploitation. To reverse the brain drain, he stresses on the need for “remedial measures.” This should be tackled by other Asian countries, he added. “Globalization, by itself, is the deprivation of some, those that we call ‘left behind’. There have to be some remedial measures. It includes one democratic movement. Some of the bright boys in one country are really exploited to go to another country,” the President said. More than 10 million Filipinos work overseas, around 10 percent of the population, remit billions of dollars back to the country each year. “All the plumbers, all the electricians, they have the masters certificate of a trade, are in the Middle East. It is actually not so bad for the nation’s economy. The downside is when a there’s a boom in real estate. It has yet to find the capable workers. And that leaves us behind because then you have to scrape the bottom to find out who can work with us. These are the effects of globalization,” Du30 said. Globalization and the rules of trade are hot topics in Vietnam this week. It is where world leaders including the US President, China’s Xi Jinping, and Vladimir Putin are set to converge from Friday for the APEC summit. The American leader also complained that globalization sends American manufacturing jobs to cheaper countries such as China. This is in spite of his country’s first world status. As these exchanges happen, Bongbong Marcos was right that the talents of Filipinos are rewarded through online jobs. Almost all office tasks can be outsourced to the Philippines through the BPO industries. The Call Center sector also continues to grow. English trainers and business consultants are also surging high. Most of all, Google that has the online trade monopoly rely on Filipino writers, website developers, and video makers to further expand the number of their advertising platforms.